Brown pelicans (Pelecanus occidentalis) can be found on both coasts of the Americas and are quite common along the coast of California, but it is a very unique pelican and its survival was at one time threatened. While it’s a large bird, the brown pelican is the smallest of the eight species of pelican, and one of only three found in the Western Hemisphere. It’s also one of only two pelican species that feeds by diving into the water—a spectacular sight to see as it power-dives, bill-first, submerging underwater for a few moments before surfacing and swallowing its catch. 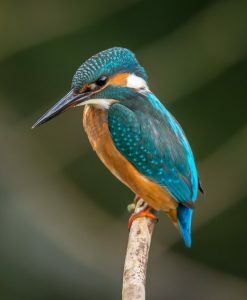 Amazingly, they can spot a fish up to 60-70 feet above the surface of the water, and that height makes for some high diving and big splash-down. Brown pelicans are also social and gregarious birds, living in flocks of both sexes and nesting in colonies on offshore islands. 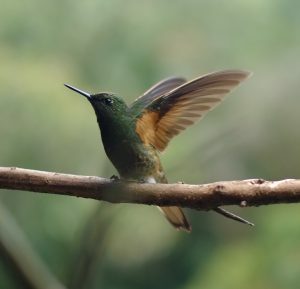 They are extraordinarily buoyant in the water as well as beautifully graceful in flight, flying in single file or “V” formation often low over the surface of the water. 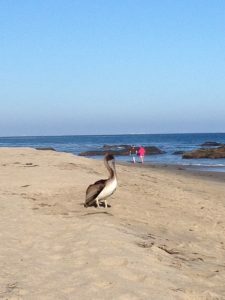 Watching the skillful performance of brown pelicans is some of the best entertainment on the beach! The brown pelican is protected by the Migratory Bird Treaty Act of 1918. In the early 1970’s, scientists discovered pesticides threatened the brown pelican by causing its eggshells to be too thin to support an embryo, which led to its listing under the Endangered Species Act, a ban on the use of the pesticide DDT in the United States, and curtailed, controlled the use of toxic insecticide. As a result of those protective government actions and other conservation efforts, the brown pelican made an eventual recovery. 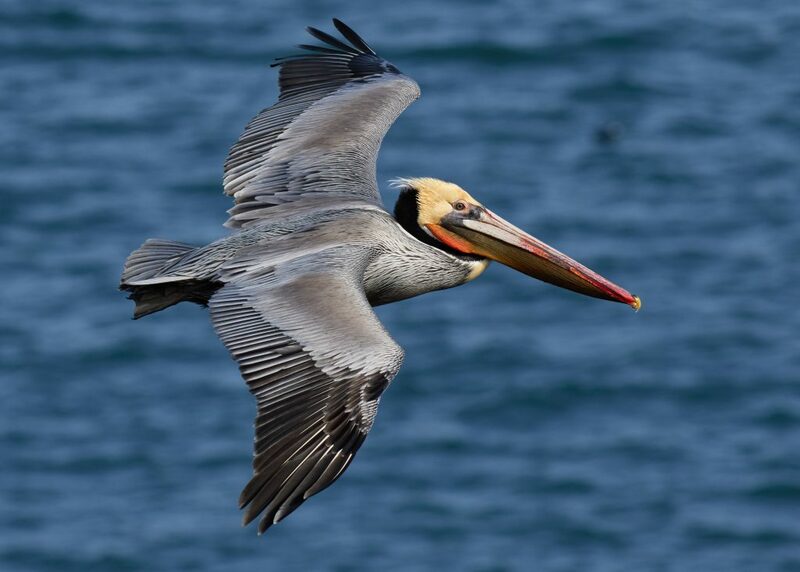 In a 2008 US Fish & Wildlife report, the brown pelican population in southern California was estimated at more than 11,000 breeding pairs, and it was officially removed from the endangered and threatened species list in 2009. 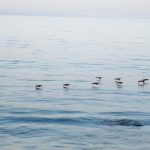 It’s a happy story of a great recovery and an example of how wildlife conservation efforts can help save endangered species, but brown pelicans still need some protection. 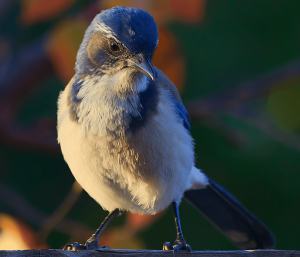 There’s concern they are highly susceptible to climate change and destructive human activity, and the only breeding colonies in the western US are located within Channel Islands National Park on the West Anacapa and Santa Barbara islands. Consequently, preservation of this vital habitat along with continued monitoring are critical to the health and survival of the California Brown Pelican. comes along during a walk on the beach. Migratory Bird Treaty Act of 1918 “makes it illegal for anyone to take, possess, import, export, transport, sell, purchase, barter, or offer for sale, purchase, or barter, any migratory bird, or the parts, nests, or eggs of such a bird except under the terms of a valid permit issued pursuant to US federal regulations”. 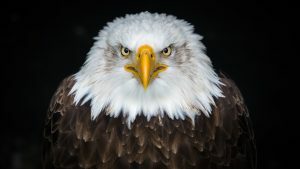 The US Fish & Wildlife Service has statutory authority and responsibility to enforce the Act. 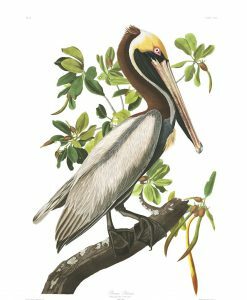 This image of the Brown Pelican (plate 251) is taken from The Birds of America by John James Audubon courtesy of the National Audubon Society, John James Audubon Center and Montgomery County Audubon Collection. 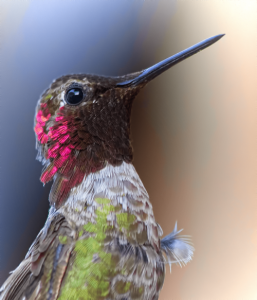 The full series of Audubon’s illustrations of birds is available for viewing and downloading free of charge. A mockingbird sang from a crabapple tree. Of happiness and joy to you without end. 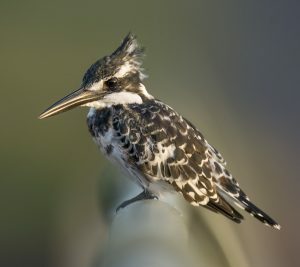 The Northern Mockingbird is the only mockingbird species commonly found in North America, and is well known for its skillful mimicking of sounds and calls and large, diverse repertoire of songs as well as its intelligence and fierce protective instincts. 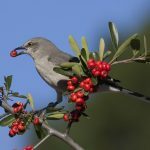 Males and females look alike, and both sing; however, the male mockingbird is more vocal, starting up in late January/February and continuing into summer in order to attract mates and establish its territory. The mockingbird has also influenced American culture, appearing in books, songs, lullabies, poetry, folklore, and mythology as a symbol of intelligence, protection, communication, innocence and generosity. Jarbas Agnelli, a multimedia artist and founder of AD Studio in São Paulo, Brazil, uses film, photography, illustrations and music to create ideas. 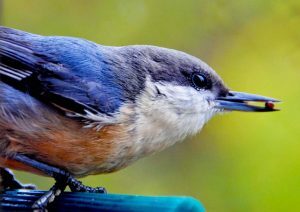 When he ran across a photo of birds perched on wires in a newspaper, he was curious to hear the melody created by the birds in the image, and composed the song “Birds on the Wires” using the exact position of the birds on wires as musical notes. 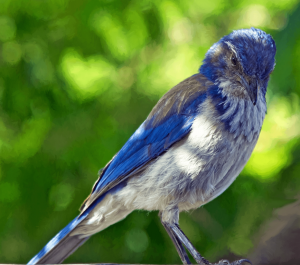 So clever—just like a mockingbird, and beautiful. Listen and enjoy here. 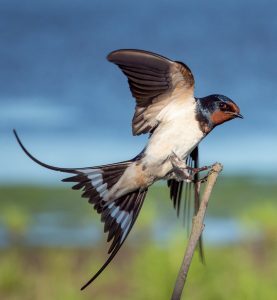 The “Birds on the Wires” video visually illustrates Agnelli’s remarkable graphic score, and has been viewed millions of times online and exhibited at the Guggenheim museums in New York, Berlin, Bilbao and Venice. 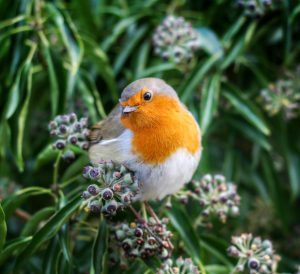 If you’ve ever had the experience of waking up to the musical sounds of birdsong, you know there’s no better way to start the day. 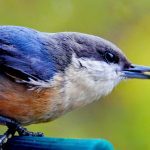 Dawn Chorus, a free alarm phone app, makes it possible to create that perfect moment in nature and wake each morning (or, after a Sunday afternoon nap) to the peaceful sounds of birds. 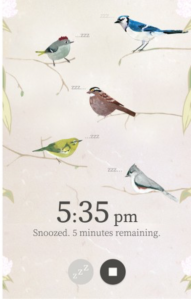 App features include customization of 20 different birdsong (with bird info & photos), snooze, and phone shake to stop. Available at the Apple App Store and Google Play. 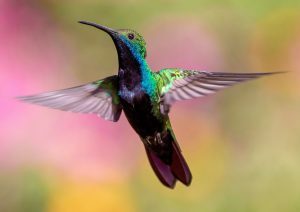 *The “a mockingbird sang” rhyme was written in my mother’s autograph book by her childhood friend. The people, experiences and emotions involved in a bicycle’s search for new purpose are eloquently told in “The Bicycle“, a short film by Chris McCoy & Adam Neustadter. 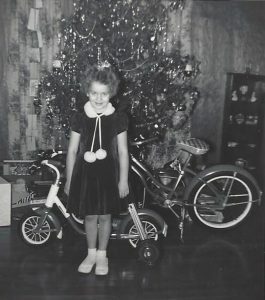 I was 8 years old, my sister was 5, when Santa Claus surprised us with two shiny and new bikes under the Christmas tree. Our first ride! It was exciting for the entire family. Mother and Dad took us both out early the next day and taught us how to ride. 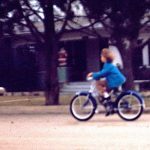 I remember being a little nervous about getting on a big bike, but it didn’t take me long to get the hang of it, and then I wanted to go fast and ride forever. What a thrill to ride all day long —cruising the hood in search of solo adventures, going to the library to hang out, testing my racing skills against any challenger (bikers, dogs & cars), visiting neighbors, and finding new friends. Many years later, my mother revealed the bikes were not exactly “new”. Dad had found rusty old, beat up bicycles, and spent weekends repairing and restoring them in my grandparent’s home cellar. That, of course, made a special gift and cherished ‘first bike’ memories even more dear. A kid with a bicycle is empowered with the ability to travel and explore, building confidence and independence, and learning valuable lessons and lifelong skills with each ride. However, many children are not able to enjoy the benefits of bike riding as there are obstacles, financial as well as safety issues that have resulted in a shocking decline in the number of children who ride bikes or walk to school in the US (48% in 1969 to 13% in 2009). Addressing these problems are community and global organizations dedicated to making bicycles accessible to every child and creating bike-friendly cities and neighborhoods, offering ‘build & earn a bike’ programs, bicycle give-aways, mechanic, repair and safety classes, group touring and activities as well as citizen advocacy projects for walk & bike safe streets. You can participate in efforts to get kids on bikes by donating time, money and/or used bikes. Sometimes it’s the smallest thing that can make a big difference in the world. ⇒ Join the conversation. Donna and Marie (@gabby) shared their ‘first bike’ memories with us on Zeester Media’s FB page. 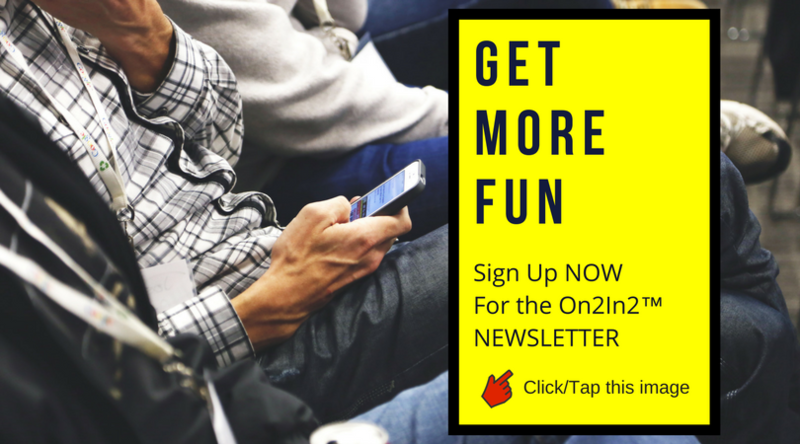 Please share your story with On2In2™ and any information that can help get more kids on bikes. To post a comment on this article or any other website page or post, you’ve got to first be logged-in (look for “Log In/Log Out” at top-right of this page). Not registered? We’d love to hear from you. It’s pretty quick & easy and free to register, just click/tap ⇒ here. Mer de Glace (Sea of Ice) is categorized a “valley glacier”, a type of glacier that originates from mountain glaciers and flows down valleys, and located above the Chamonix valley within the Mont Blanc massif mountain range of the French Alps. Formed by the confluence of the Leschaux and Génant glaciers, the Mer de Glace is the longest and largest glacier in France, and one the biggest tourist attractions in the Chamonix valley as it’s accessible by the historic Montenvers Railway (Chemin de fer du Montenvers) and offers spectacular mountain views as well as tours, exhibits, and restaurant/hotel. 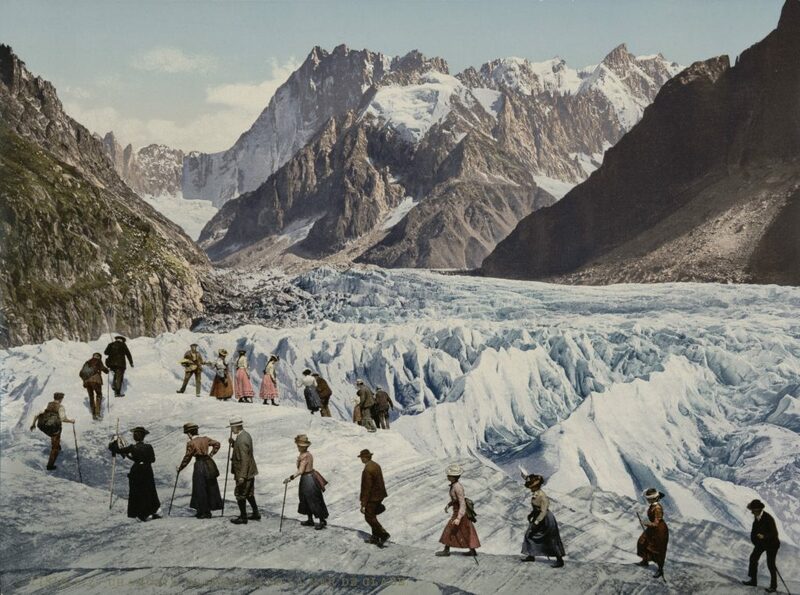 However, the powerful beauty and recreational benefits of Mer de Glace were not always appreciated. During the classical and medieval periods of European history, ice was deemed mysterious, evil and dangerous, and glaciers aroused intense fear as they were thought to be inhabited by demons that swallowed up unwary victims as well as whole villages. Consequently, glaciers were avoided, not explored, deepening myths and superstitions for many centuries. In 1690, fearful villagers of Chamonix took action against glacial evil by retaining the services of a bishop to exorcise the glaciers. Two Englishmen on expedition to Chamonix in 1741, William Windham (1717-1761) an English landowner and Richard Pococke (1704-1765) a high ranking clergyman and anthropologist, disregarded the forewarning of evil lurking in glaciers, and climbed up the mountain for 3¾ hours with the aid of local guides and porters to carry wine (essential drink for 18th century adventure travelers) and provisions. It was a successful excursion as they returned safely and were able to provide the first written description of the glacier they called ‘Mer de Glace’. 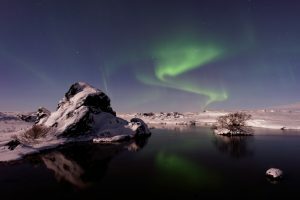 The achievement also marks the beginning of change in attitude as the phenomena of the Sea of Ice later attracted writers, adventurers, artists and photographers. Two hundred and seventy-five years later, the explorers of Mer de Glace are on skis. 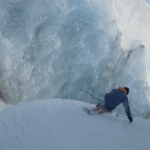 In the video Ice Call from PVS Company, pro skier, Sam Favret, takes you on a freestyle tour through the icy waves, trails, and tunnels of Mer de Glace. Mer de Glace is certainly skiable, and you don’t have to be a ski pro like Sam Favret or an expert to enjoy the unique backcountry experience via the iconic off-piste ski route, Vallée Blanche. But, there are risks. The surface of Mer de Glace is very rough with gradient drops, large hunks of ice, deep crevasses, and seracs, making it extremely dangerous without sufficient snowfall, good intermediate skills (in all types of terrains & snow conditions) and a local mountain guide. 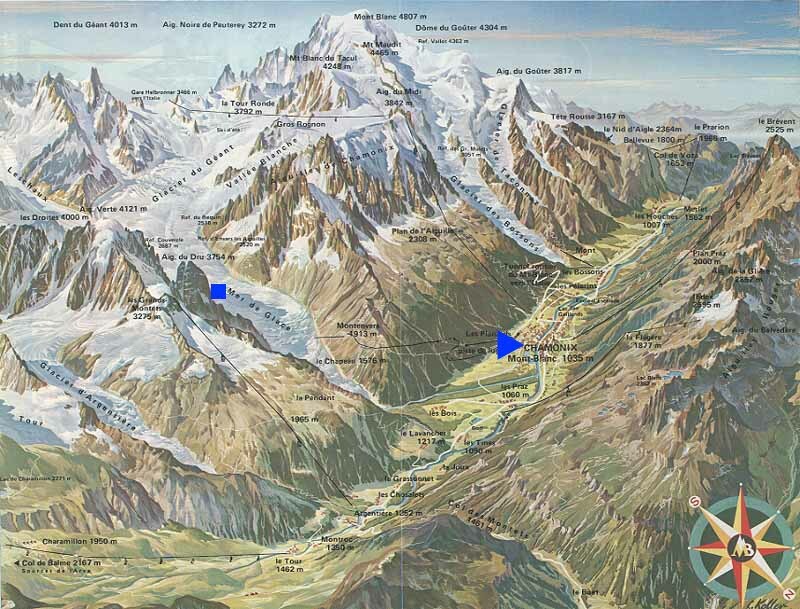 The Vallée Blanche is accessible from Chamonix, France via a 20 minute ride on the Aiguille du Midi cable car to the mid-station Plan de l’Aiguille (2,317m), then a walk through a tunnel and down a precarious ridge to a small, level area— the starting point for the main Vallée Blanche runs. There are four: the classic “voie normale” (the normal way), and the more challenging, Le Vrai Vallee Blanche, the Petit Envers du Plan and Grand Envers du Plan. For the most part, the voie normale follows the valley floor through dynamic terrain, beginning with a descent into a bowl toward a large rock outcrop known as Le Gros Rognon (The Big Rock) and continuing along the mountainside. 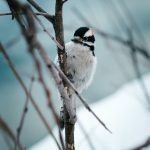 The run can be nice and smooth in spots, but depending on weather conditions, there could be deep powder, crusty layers, and icy moguls to navigate. About 2/3 down, the Refuge du Requin is a popular place to take a break, and 250 meters from there is the start of Mer de Glace. If snow conditions are good, it’s possible to ski all the way down to Chamonix. If not, the run ends at Montenvers, thus requiring a steep climb up iron stairs (misery!) to a gondola that connects to the Montenvers Railway. At a leisurely pace, including lots of stops, sightseeing and long lift queues, the up/down round trip will take 4 – 6 hours, but don’t rush…..enjoy the ride and take in the views. Valley glaciers like Mer de Glace are relentlessly moving, flowing, growing, shrinking and deforming as a result of weather (temperature and snowfall) and stresses caused by the massive weight. As a result, they are appreciable indicators of climate change. 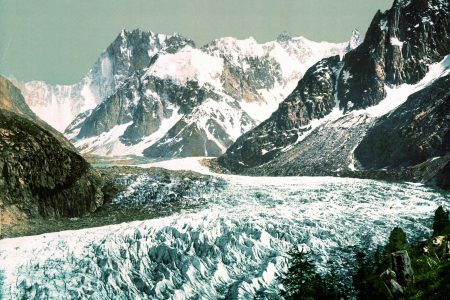 After a significant cold period in Europe during the late 19th century, Mer de Glace was so large that it reached as far as Chamonix in 1850. Today, it’s hardly visible from Chamonix as the lower end of the glacier (the ‘snout’) has been shrinking during the last 30 years at a rate of about 4-5 meters (13-16 feet) a year. There is concern the retreat will not stop as Mer de Glace is an important fresh water source for the region as well as a tourist destination, and Christian Vincent, a French glaciologist with the Laboratoire de Glaciologie et Geophysique (LGGE) and Institut de Recherche pour le Development (IRD), has warned it may shrink as much as 1.2 -1.4 kilometers (about ¾ of a mile) by the year 2040. This “More Than Just Parks” video, Voyageurs 8K, is a Pattiz Brothers Film, produced by Sea Raven Media. 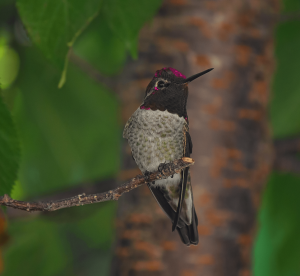 It was filmed during a few weeks time spent at Voyageurs National Park, Minnesota USA. The views are breathtaking, and will take you to a wonderful place. Watch in full screen and use earphones for the ultimate experience. 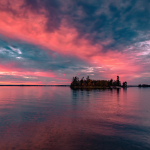 After eight decades of public and legislative contention, 218,054 acres of the lake country of northern Minnesota were established a US national park in 1975, “Voyageurs National Park”. The name of the park is in recognition of the legendary French-Canadian “voyageurs” canoe men hired by trading companies to transport trade goods and furs in the area during the 18th and 19th centuries. 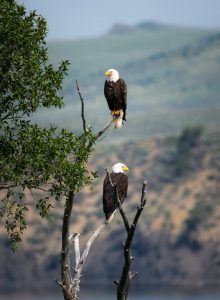 It’s a beautiful park with landscape, geology, wildlife and history creating an exceptional outdoor setting for an awe-inspiring visitor experience and year-round recreation. There are 30 park lakes (40% of the area), providing open water for boating, canoeing and kayaking from mid-spring through mid-fall, and fishing throughout the year (ice fishing in winter). 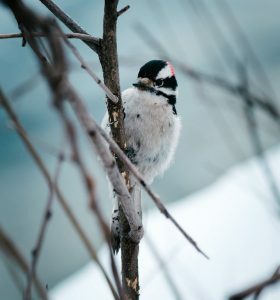 The eco-rich landscape and diversity of wildlife offer opportunities for hiking, birding (over 240 species, including bald eagles and osprey), and nature walks while the northern latitude location and dark skies make for excellent stargazing and a chance to see the Milky Way and northern lights. During winter months, the park becomes a frozen wonderland—perfect for snowshoe and cross-country skiing as well as snowmobiling over 110 miles of maintained trails. More Fun in the Parks: There are more than 400 US national parks available to everyone, every day. Most are free to enjoy, and the 117 that charge an entry fee offer fee-free days throughout the year. Use the search tools here → Find Your Park to find the perfect place to visit. FREE To WATCH the Natural Beauty channel, an On2In2™ collection of short videos, including other More Than Just Parks films. It’s a great way to escape for a few minutes, and start planning your next outdoor excursion. 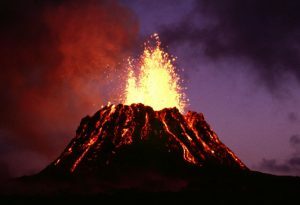 Located on the Island of Hawaii (the Big Island) in the Hawai’i Volcanoes National Park, Kīlauea is one of the most active volcanoes on planet Earth, and the fire goddess really puts on a big show. You’ve got to see it. in the high desert country of southeastern Utah. During an end-of-summer visit to Vermont, my friend, Catherine, suggested a “sunset” hike up Snake Mountain. We didn’t see the sunset, and got a little lost on the way down (despite the fact it’s an easy loop-trail with signage), but we had a mountain of laughs on this little adventure and learned a lot, too. 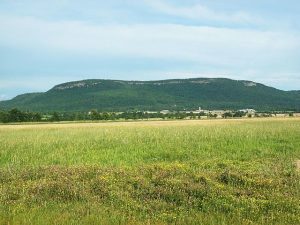 Geography Snake Mountain is part of a series of scattered hills extending from the greater Taconic mountain range, and is oddly separated from other mountains within the range so that it appears prominently up 1,287 feet from the surrounding flat landscape of Champlain Valley. 1,215 acres span the upper slopes and summit of Snake Mountain. Not far from the summit is Red Rock Pond, a small, shallow pond surrounded by hardwoods and a rocky ridge. Near a summit known as Cranberry Bog is a 10-acre wetland about 33 feet deep and more than 9,500 years old. At one time, locals referred to it as “Rattlesnake Mountain”, likely because of the venomous Timber Rattlesnakes believed to be living within the rocks and ledges. Local legend also includes the story of a menacing “Black Beast of Snake Mountain” haunting the mountain slopes. During a period of time when mountain top resorts offering guests fresh air and breathtaking views were popular in the Northeast, Addison County resident and Vermont State Representative, Jonas N. Smith (1805 – 1884), built the Grand View Hotel on the summit of Snake Mountain in 1870, and it then became known as Grand View Mountain. The hotel was destroyed by fire and abandoned in 1925, but reminders of its history are still visible on Snake Mountain, including the hotel’s concrete slab foundation at the summit and the carriage road that once shuttled vacationers up to the hotel (still used today by hikers as the main trail to the summit). 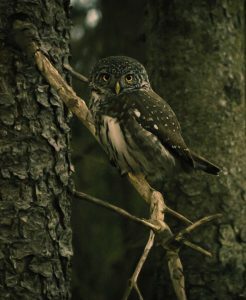 In 1959, the Vermont Fish & Wildlife Department began acquiring land in order to establish the Snake Mountain Wildlife Management Area for the purpose of conserving wildlife habitat and providing public access. Habitat and Wildlife Snake Mountain is home to many creatures, plants and a few snakes. 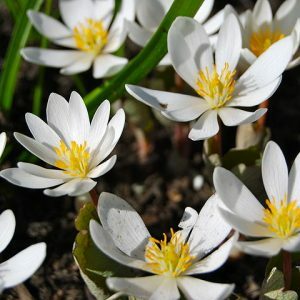 Herbs and Wildflowers Among the forests and wetland grow white trillium, dog’s-tooth violet, bloodroot, sweet cicely, beech-drops, large-flowered bellwort, bishop’s-cap, hepatica, Canada-violet, dwarf ginseng, small-flowered buttercup, Christmas fern and rattlesnake fern. 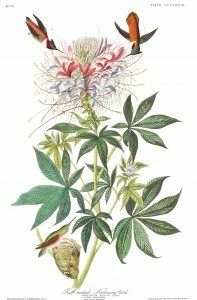 Look for back’s sedge, four-leaved milkweed, handsome sedge, needle-spine rose, hair honeysuckle, large yellow lady’s-slipper, podgrass and squaw root. The Vermont state-endangered Douglas’s knotweed has also been found. Mammals White-tailed deer winter in the area. Coyote, bobcat, red and gray fox, raccoon, cottontail rabbit, gray squirrel, and the occasional moose and bear also inhabit Snake Mountain. 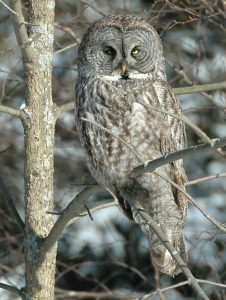 Great Grey Owl, jok2000 CC BY-SA 3. Reptiles and Amphibians You can find a variety of salamanders (red-backed, Jefferson, four-toed, blue-spotted and spotted), American toads, spring peepers, gray tree and wood frogs on Snake Mountain. Milk, brown and garter snakes may also be seen. 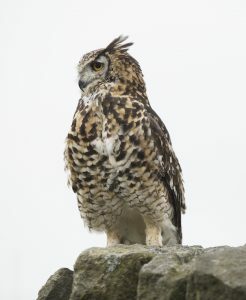 Recreation Snake Mountain is open to regulated hunting, trapping, hiking and wildlife viewing. 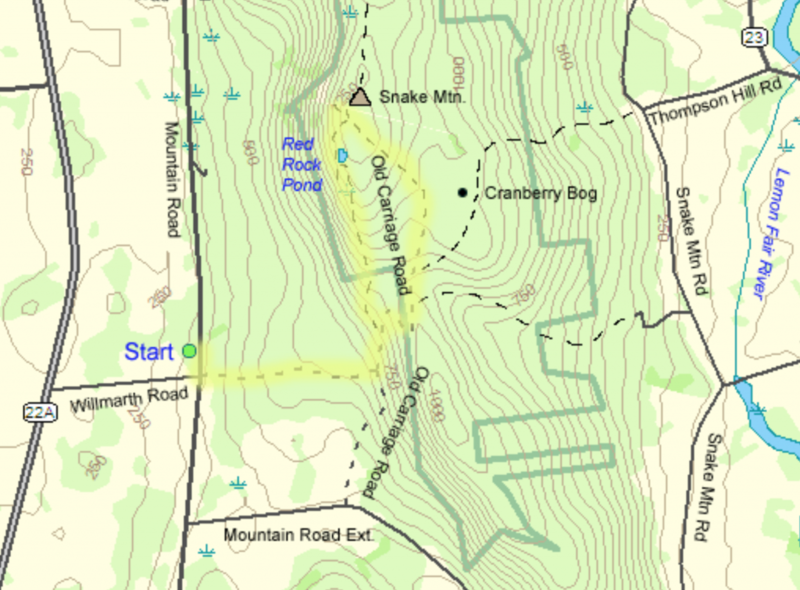 A network of walking trails crisscross the mountain and provides access to the summit, Red Rock Pond, and Cranberry Bog. 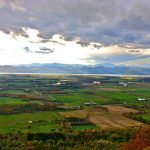 The accessibility, easy climb, and expansive views of Champlain Valley and the Adirondack Mountains from the summit make it one of the best beginner hiking trails in Vermont and a local favorite. ♦ “It’s muddy and buggy”. That was the advice we were given by a local, and it was spot on. Don’t forget the bug spray, along with water, binoculars and camera. ♦ The hike to the summit and back is approximately 5 miles and can be accomplished in about 2 hours. During our hike, a runner using a pair of trekking poles passed us going up & down the mountain. The guy was flying, and I decided I needed some of those poles! 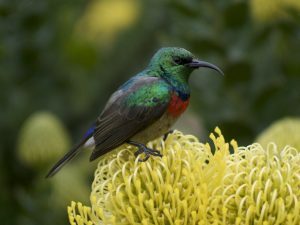 * SHOP Trekking Poles and Hiking Staffs That’s a great workout; however, the fun of Snake Mountain is the experience of getting away, exploring, enjoying nature and the views. Take your time, stop, rest & look around, and listen to the quiet of the forest. ♦ The main trail starts at Wilmarth Road up the old carriage road. It’s a wide path with a steady 30% incline and bypass paths along the way to help hikers avoid muddy spots. The trail gets rockier, narrow and winding as it gets higher with a jag left about 1/3 of the way up. (The road to the right is Mountain Road Extension, and you don’t want to go there during either the ascent or descent because you’ll wind up back tracking.) Just short of the half-way point, the trail connects on the left to a more narrow and steeper alternate summit trail that takes hikers past Red Rock Pond. Either trail takes you up, but probably best (especially for first-timers) to continue to the right on the old carriage road, and descend down by way of the Red Rock Pond trail or back over again the easier old carriage road trail. ♦ Some of the trail paths cross over private lands. Be respectful and watch for signs (seems simple enough, but so easy to take a wrong turn). 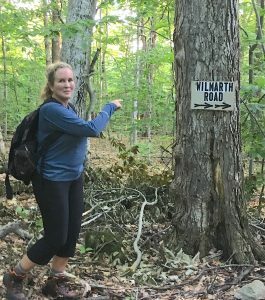 The “Wilmarth Road →→” sign is there to guide hikers away from a wrong turn on Mountain Road Extension during descent, but my friend and I were distracted and missed it, and (you guessed it) had to double back once we finally realized the trail was not looking quite right. ♦ Dogs are allowed, but must be leashed. ♦ Plants may not be picked on public land. Snake Mountain is located in west-central Vermont between Addison and Weybridge. From Burlington, drive South on Route 7 to Route 17 West toward New York. From Middlebury, drive from the college north on Weybridge Road (23); turn left/west onto Route 17. At the Route 22A intersection (there’s a general store and white town hall building), turn south on Route 22A. Drive 2.5 miles and look for Wilmarth Road street sign (a gravel lane that cuts through fields). Wilmarth Road intersects with Mountain Road, and you’ll see the start of Snake Mountain trails at the intersection. Turn left onto Mountain Road. Park a short distance down the road in the small, unmarked gravel parking lot on the left. *This page includes an affiliate link to Amazon. 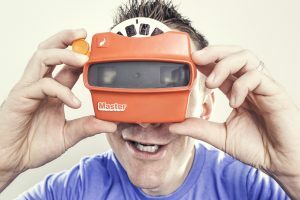 If you purchase a product or service directly through the link, Zeester Media LLC may earn a small commission. This in no way affects the price you pay for the purchase. Have a favorite hiking trail? We’d love to hear from you! 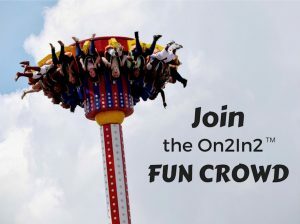 in a comment to this post, and have not yet registered as an On2In2™ playmaker, please sign up via the ‘Engage page’. Don’t worry, it’s pretty quick and easy (unless you’re a robot). 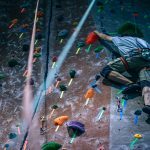 Sport climbing competitions are usually held indoors on purpose built climbing walls, featuring three main disciplines: lead, bouldering and speed, all requiring different skills from the athletes. The International Federation of Sport Climbing (IFSC) organizes a series of international climbing competitions throughout the year, including the Climbing World Championships, and the sport will be in the Olympic Games for the first time in 2020. Lead climbing is probably the most well-known as competitions have been organized for more than 30 years. Climbers in lead competition face a 15 – 20 meter high artificial wall, and climb with a rope for safety. The goal is to climb as far as possible on a previously set route within a time limit. The winner is the climber that climbs the farthest. In order to be successful in lead climbing, athletes need a lot of power endurance. Bouldering is a form of rock climbing performed on small rock formations or artificial rock walls, known as ‘boulders’, without using ropes or harnesses. Mats or mattresses (‘crash pads’) are placed on the ground to help prevent injury from falls. 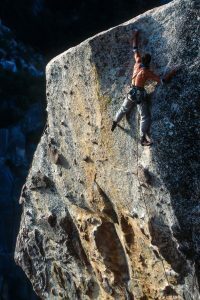 It began as a training method for roped climbs and mountaineering, then evolved into a separate discipline of sport climbing in the 1990’s. Bouldering competitions feature extremely difficult sequences and complex moves (or ‘problems’) within a short climbing route, time limits, and close proximity to spectators. Competitors are typically allowed several attempts, but they cannot watch other climbers on the boulder or receive advice or coaching after competition has started. Score is determined by the overall number of routes made by the competitor and the number of attempts. If a climber doesn’t reach the finishing hold at the top of the climb, points may be awarded for having reached a particular hold during a climb, the ‘bonus hold’ or ‘Zone’. During speed competition, the winner is determined over many rounds where both speed and endurance are required, but time is everything. In the combined format competition (aka the ‘Olympic Combined Format’ as it will be format for 2020 Olympic Games in Tokyo), athletes climb each sport climbing discipline (lead, bouldering and speed). A score is given by multiplying the competitor’s ranking (place) in each discipline. All disciplines are weighted the same. If you missed the 2018 IFSC Climbing World Championships live stream broadcast, there’s still time to watch video recordings of world elite climbers compete in lead, bouldering, speed, combined format, and paraclimbing. Just click/tap the play button located in the center of any media player posted below. FREE To WATCH: CLIMBING, an On2In2™ video collection of extraordinary climbs and personal stories of adventure in the mountains and on the rocks. Aerial dance is a form of modern dance recognized since the 1970’s. Choreography involves an apparatus (e.g. trapeze, fabric, hoop, wheel, counterweight, rope) that allows dancers to perform in three dimension and explore innovative vertical and horizontal movement. California vertical dance company, BANDALOOP, turns the dance floor upside-down during both indoor and outdoor performances that seamlessly combine physicality, choreography and the art of climbing on skyscrapers, bridges, billboards, and rock cliffs. In the short video, SHIFT, the sport of rock climbing and dance are beautifully merged by BANDALOOP in three separate wilderness performances on landmark rock faces within Yosemite National Park, including Mount Watkins. It’s a show of breathtaking skill and artistry. Want to give it a try? 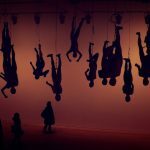 Everyone can experience the magic and artistry of an upside-down dance performance as there are classes, festivals and performances around the globe. Just take a look, and check out the information/resources provided below. 2018 Irish Aerial Dance Fest (June 24 – July 11) A variety of high flying entertainment, classes and training courses (beginner on up) at this annual festival organized by Fidget Feet, an aerial circus company from Ireland. In order to protect more than 1.35 million acres of land containing historic, cultural and natural resources in the high desert country of southeastern Utah, President Barack Obama designated Bears Ears a national monument in December 2016 under the Antiquities Act of 1906. 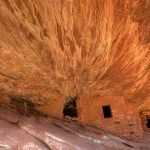 Bears Ears has long been considered sacred by Native American tribes, a place for spirituality, healing and reflection, and they have worked since the 1930’s to protect and preserve it as the presence of Native American culture within the area can be traced back many thousands of years. 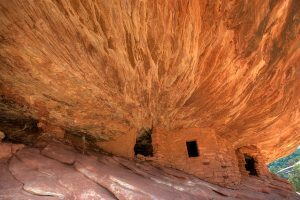 There are an estimated 1,000 archeological sites located in the Bears Ears landscape of red rock, juniper forests and high plateau, the majority not yet studied by western archeologists, including the visually stunning, 3,500 year old Ancestral Puebloan cliff dwellings, great houses and villages, ancient roads, shrines, and rock art. Designation as a US national monument offers protection against excavation or destruction for these invaluable antiquities so that they may be preserved for the benefit of future generations. However, Bears Ears is again at risk as it has gotten caught up in politics. In December 2017, President Donald Trump issued a proclamation that purports to overturn the creation of Bears Ears National Monument. Protests, lawsuits and congressional bills followed, and documents obtained from the US Department of Interior indicate that the purpose of revoking the Bears Ears National Monument designation was to open up the lands to oil and gas and uranium development. While 16 US presidents have designated 157 national monuments under the authority of the Antiquities Act (Devils Tower National Monument was the first in 1906) and federal courts have repeatedly upheld presidential national monument designations, it often arouses controversy over issues of industry/business development v. protection and preservation of federal lands and its natural resources. Just one example — the Grand Canyon. Today, it’s considered an American treasure, but not everyone was on board in the beginning. A senate bill was first introduced in 1887 to establish the Grand Canyon a national park, but it died in committee and mining and logging were allowed to continue in the area. In 1908, President Teddy Roosevelt, an avid outdoorsman and conservationist, used his authority under Antiquities Act to proclaim more than 800,000 acres of the Grand Canyon a national monument. A bitter fight began and continued for more than a decade as opponents filed lawsuits claiming President Roosevelt had overstepped his authority and attempted to block all efforts to reclassify the Grand Canyon National Monument a national park. Fortunately, preservation advocates eventually prevailed. Grand Canyon National Park was established by an Act of Congress signed into law by President Woodrow Wilson on February 26, 1919, and currently receives approximately 5 million visitors each year. Defenders of the Grand Canyon did not give up, and more than a century later, the fight for Bears Ears National Monument is just as intense. Visitor Information – Utah Office of Tourism, Bears Ears National Monument The best times to go are March – June and September – October.